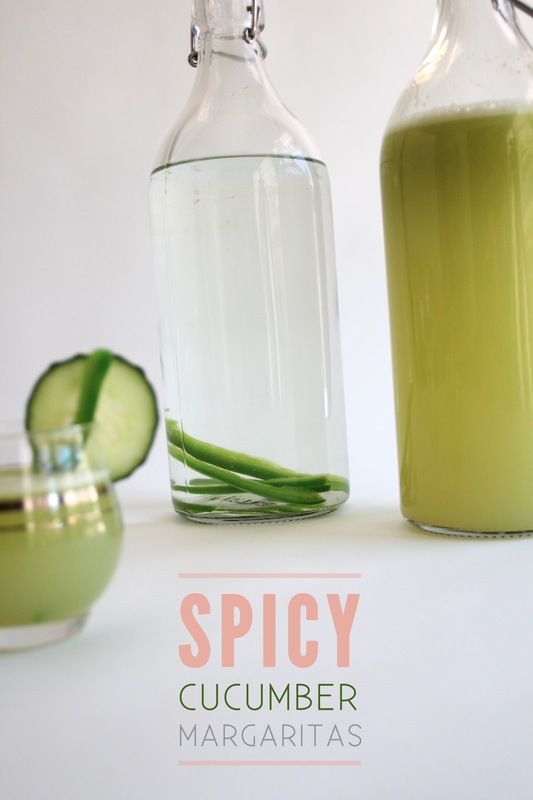 I have an obsession…it’s spicy drinks! Weird but so delicious. I tasted habañero kombucha some time last year and I haven’t been able to kick the habit. Last weekend, I was invited to a boozy tea party (fun, right?). 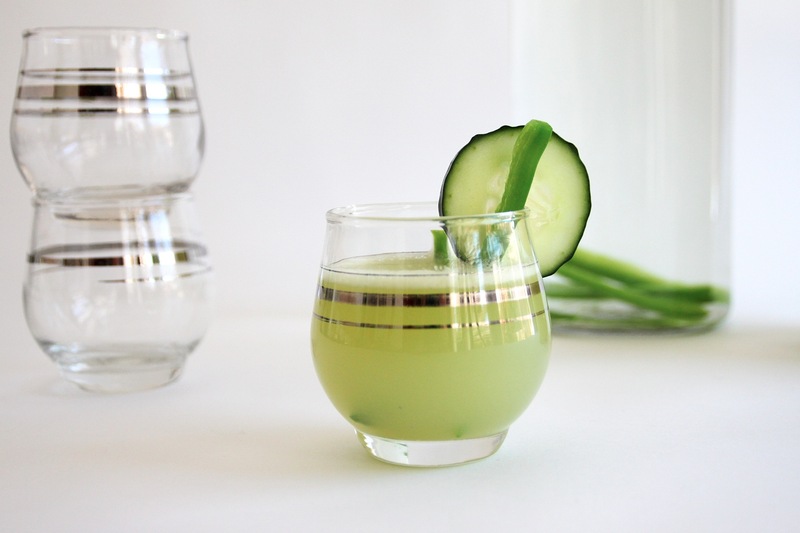 It was ridiculously hot that day so I wanted to make something refreshing but sorta special, not your typical cocktail – that’s when I decided to combine cucumber juice with lime juice and spicy tequila. Best idea I’ve had in a while. Want to learn how to make this? 1. 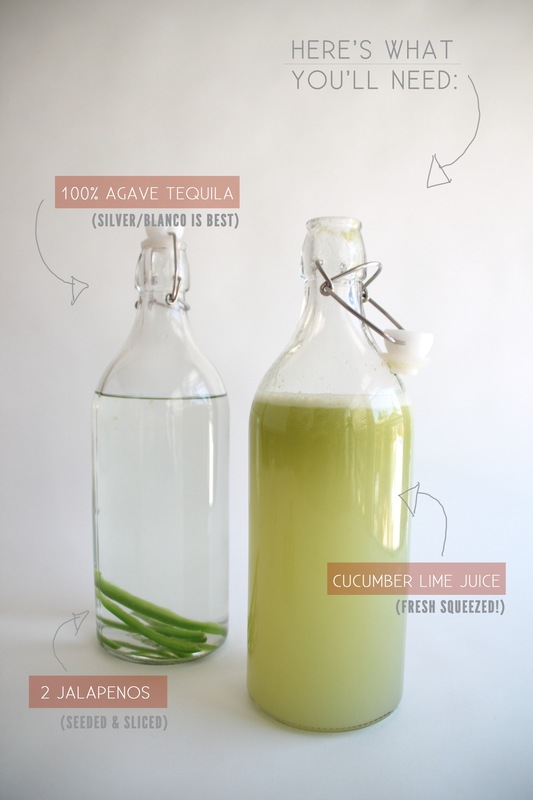 Drop sliced jalapeno directly into tequila bottle. Let sit for at least 1 hour and strain (the longer the tequila sits, the spicier it will become). Note: do not leave jalapeno in longer than 24 hours. It can spoil and ruin your tequila…and that would be so sad. 2. 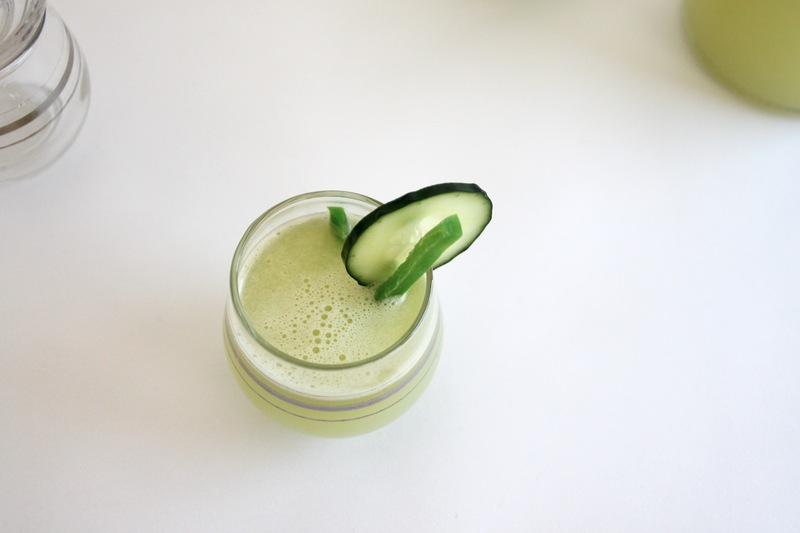 Combine the juice of 3 peeled cucumbers and 2 cups fresh squeezed lime. You should have about 3.5 cups of juice mix total. Mmmm! Ginger + Prosecco sounds amazing! I’ll have to try that. 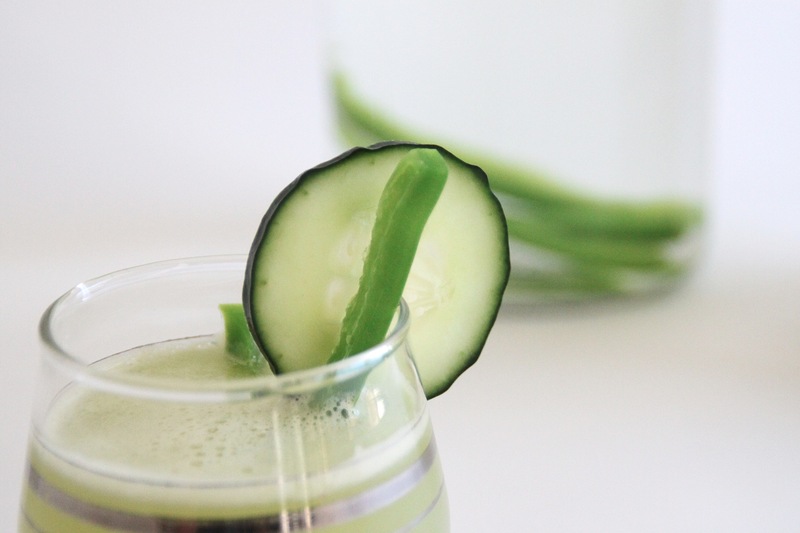 Sounds refreshing – yum! And I love those glasses. Are they vintage? Hi Jennifer, not sure if the glasses are truly vintage but I found them on Ebay and they were titled Vintage Mad Men Ball Glasses. I love them! That sounds sooo good! 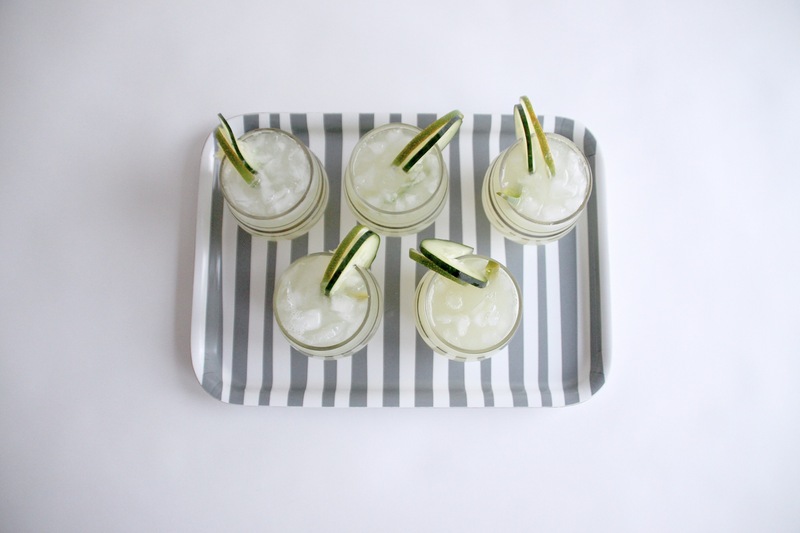 And I love the striped tray and fab glasses. I had my first spicy cocktail this past June in Jackson Hole, WY. I had never heard of spicy margaritas and the first one I had was a little too spicy, but my sister-in-law served a better, less spicy version at her wedding. So delicious! I had to remind myself that I had a limit. haha. I was just in Jackson Hole, WY! So wierd….and random! Spicy cocktails are definitely not for everyone but once you’re hooked, your hooked, right?!! Totally. That is weird! My sister and brother in law have a barn out there in Tetonia. So beautiful out there!